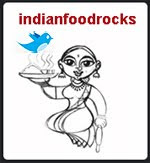 Indian Food Rocks: Late! Late! Late! lovely. i've never eaten these before. i was about to nick that super luscious tomato chutney pic - the one you made from ammini's book. Hey Manisha, these look like raisins, havent tried them, get well soon, dear! Now what are these, Goji berries, got to google for them eh! Whats up with riddle me this? These berries would have been a fitting entry. you feel old! c'mon chica we are in our prime - i hope the goji berries help you. i love them and have them 3-4 times a week in my multi-grain porridge! 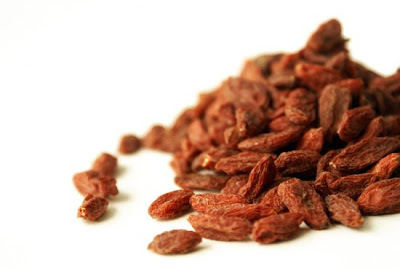 I saw these goji berries when i went for shopping, in a health shop and i didn't know what to do with them. So didn't buy. Thankyou for the info about hiw good they are, i al sure going to buy them next time when i am in that shop. You did write you should cook them before you add them to cupcakes, if you add them without cooking to the cupcake, doesn't they cook them while the cake is baked. Oh dear, ...late...for a very important date...said the Rabbit. lovely click..Never heard of these berries..
Bee, sorry I'm late! I'd taken these pics but didn't have the time to process them or write a post. Rachna, once cooked, their texture is very like raisins. Anjali, this is pretty comprehensive. I thought of doing it as an RMT post but I had literally 15 mins to write this post and then run. One RMT is due from Harini soon and the other from Oxy. So keep checking their blogs for the latest RMT or subscribe to their feeds. Meeta, out on the snowshoe trails, I am young and carefree - my phone has no signal and the air is crisp and fresh. On all other days, I find that I have to hit the ground running. I can't wait to get away over President's Day weekend! Happy Cook, I haven't yet baked with them so I assume they would cook. Let me find out more and tell you, ok? Ashwini, now you have! And thank you! I have never tasted these barries before, but was intrigued by them so I had got a packet on my last grocery shopping trip. Now I know how to make tea out of them ;) thanks to you! No hurry s i have to go to the health shop to get these beries. I've been wanting to try these berries out..lovely picture Manisha. I think many people feel overwhelmed and "trying to catch up" now days. Isn't it just the sign of the times? On optimistic days I try to do my best and not sweat the rest. On other days I feel just like what you said. take care. Hey Babe, I hope that you are feeling a lot better. Hi, Hon, glad the gojis are working their magic for you! 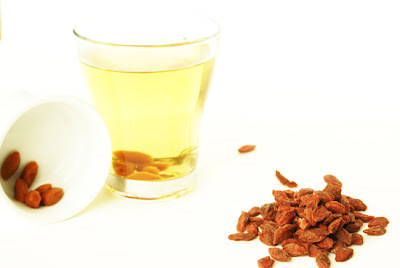 We haven't been using them everyday like we did in Hawaii because they're so much pricier here, but I'm going to try a goji tea now 'cuz I've been in a slump for awhile also... hope your back is better too! Great photos! Never tried Goji berries before. Looking forward to it. lovely. i've had it with green tea, prepared by a chinese colleague. they're gorgeous like that.